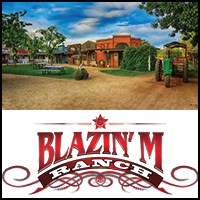 Blazin’ M Ranch. The Very Best of the Old West. Over the past two decades, thousands of guests have enjoyed the authentically replicated Western town, for an experience unlike any other. Along with a chuckwagon dinner and live musical entertainment, guests enjoy a museum, saloon, shooting gallery, Old-Tyme photographer, and Western shops. The Employee Network members receive 10% off entire party by using promo code empnwkdsc when calling 928-634-0334. OR book online with The Employee Network discount automatically applied.